The new school year is upon us and our law firm always receives calls from former and now current clients for traffic offenses involving passing or over-taking school buses. This is a serious offense which can result in a driver’s license suspension following a conviction. While most of my blogs are focused on offenses related to drunk driving, narcotics and illegal firearms and guns, I always want to ensure that my readers are up to date on concepts that could have serious consequences. When you meet or overtake a stopped school bus with red lights flashing and a stop arm extended, you must stop. When you approach an intersection where a school bus is stopped with red signal lights flashing and a stop arm extended, you must stop. You must wait until the red lights stop flashing the stop arm has been withdrawn before moving. 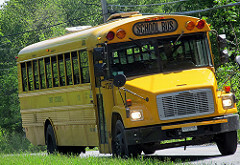 In Pennsylvania under 75 § 3345 (a) passing, meeting, or overtaking a school bus is a summary offense. This means that while it isn’t graded as a misdemeanor or a felony crime, it can, technically result in a jail sentence (max 90 days). In the Commonwealth, a driver must stop at least 10 feet from a bus when the red signal lights are flashing and the signal arms are activated even if a road has painted lines or ridged/grooved road dividers. A driver approaching an intersection where a school bus is stopped must also stop at the intersection until the flashing red lights are no longer activated. In Pennsylvania, “meeting” a school bus is defined as a driver in the opposing lane facing a school bus while “overtaking” a school bus means a driver is behind the bus and passes the bus in the same direction of travel. A conviction under 75 § 3345 will result in a $250.00 fine, a 60 day license suspension, and 5 points on their driver’s license. In addition to this traffic offense, a driver could also face other potential criminal charges depending on the circumstances surrounding the vehicle infraction (speed, conditions). These criminal charges include recklessly endangering another person (Title 18 § 2705—misdemeanor of the 2nd degree) and obviously felony charges if the drivers action results in any physical harm or a fatality. See my articles on aggravated assault by vehicle (DUI and non-DUI related). In New Jersey, like Pennsylvania, the law is very similar with regards to passing school buses while the red flashing lights are activated. The laws in the Garden State and the Commonwealth are designed to protect children and they were specifically created because there were prior incidences where children were seriously injured or killed due to drivers aggressive driving. The law in New Jersey is a little different than Pennsylvania. Drivers must stop 25 feet away from a school bus as opposed to 10 feet when the red lights are flashing. Like Pennsylvania, a first offense will result in a fine ($100), along with up to 15 days in jail or 15 days of community service, and 5 points are also added to a person’s driver’s license. (See 39: 4-128.1). While there is not a mandatory minimum license suspension, it is within the discretion of the director of motor vehicles to suspend your license. For more information on traffic offenses in New Jersey and Pennsylvania please contact our office.